I've asked for help on identifying this novel about a year ago but nothing. So here goes again. Ancient intelligent lizard species running out of food to the extent they are eating their own eggs. They invent time travel to the present and commence changing the present environment for their own purposes. They are so superior to humans they appear as ancient "lords" or "princes" and they have vast powers. I read this in the early 90's but it may have even then been up to a decade old. If I recall correctly, the terraforming is along the lines of the strange growths and the reptiles are long the same lines as well - in Dean Koontz' "The Taking". The revelation about the provenance of the lizards comes quite late in the novel. Aldiss' "The Saliva Tree" is also similar but there was less skill in the book I'm after as I recall than Aldiss, who of course was simply a master. It was nonetheless an excellent read if my aging synapses recount accurately. This looks like it could be one of the books from the "Time For Dragons" Trilogy. NB I haven't read it personally. 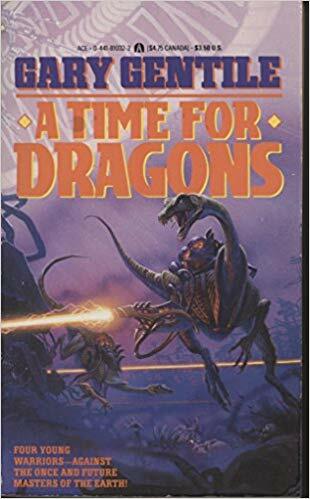 This book takes place after the crew of main characters (humans) have destroyed the dragons in the present, they've struck a great blow against their enemy in the past and are headed to the Jurassic period to finish the job. So there definitely appears to be a time travel aspect to the series. Hopefully the cover of the first book "A Time For Dragons" will enable the QA to tell if this is the correct answer. If this is the correct answer, then I need to give a big shout out to danny3414, whose comment above helped me find this series. Not the answer you're looking for? Browse other questions tagged story-identification novel terraforming or ask your own question. 1980's children's novel about present-day post-nuclear USA?